Landscaping with holly allows for color in the garden even during the long winter months. 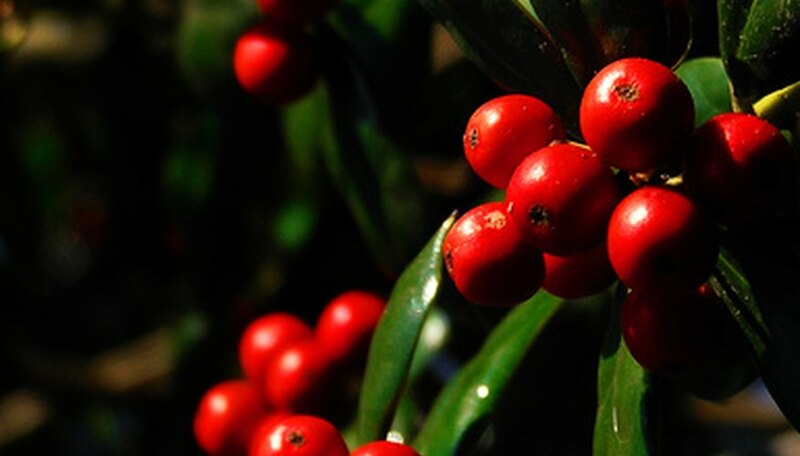 Holly is evergreen and produces red berries that stay on during the winter. Their glossy foliage adds interest to the garden in any season. Holly is moderately easy to grow and requires little maintenance. A good occasional pruning is necessary to keep the bushes in shape, but little else is needed. Choose from the over 700 varieties of holly that are available. Some varieties have small, compact leaves, while others have larger ones. 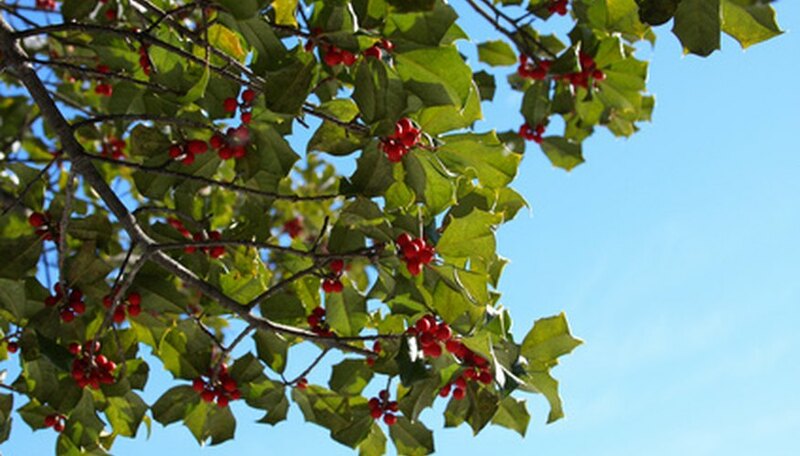 Most holly leaves are green, but one group features leaves with a blue to greenish-blue tinge, and the berries are white to blue. Pick from extremely tall varieties all the way down to the dwarf hollies. Place dwarf varieties around flower beds for a beautifully dense border. Most dwarf hollies grow 3 feet high or less, and can be pruned even smaller. Dig a trench about 4 or 5 inches deep around a flower bed, and place the holly plants in the trench to accommodate the root ball. Space them about 8 inches apart, and fill in with soil that has been amended with compost and peat moss. Water well, and cover the roots with mulch to retain moisture. Once the holly starts to grow, it can be pruned with pruning shears to any shape. Give it about one month to get completely rooted in the ground and established before clipping. 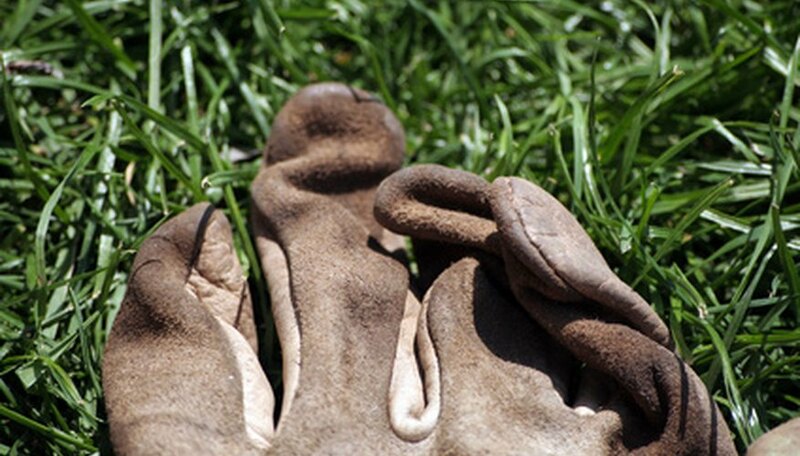 Always wear protective gloves when pruning holly. Hide the foundation of the house with a medium-size holly, or use holly that grows 3 to 5 feet high, to hide a well or the central air-conditioning unit in the yard. They will grow dense, so leave an area where you can get in to service the unit, and plant far enough away that maintenance can be performed without being pierced by the thorny leaves. Dig a hole deep enough to accommodate the roots of the plant. Plant medium-sized holly about 6 to 8 inches deep in individual holes. Some varieties have smaller root balls, so the rule is to plant about twice as wide and a few inches deeper than the root ball. Place plants about 1 foot apart, because they will get too crowded if planted closer together. Medium-sized plants can be pruned the same way as the dwarf plants. It may take a year or so for them to make a dense hedge. Plant large varieties as a screen between properties, or to section off an area of the yard. Use varieties that grow over 6 feet high. You can make a dense hedge or fence with them. The spiky leaves will keep dogs and other large animals out of the yard. Dig a hole twice as wide as, and 4 to 6 inches deeper than, the root ball. Space trees and large holly bushes 1 1/2 to 2 feet apart. Know if the holly purchased is dioecious, meaning there is a gender to the plant. Most hollies are either male or female, and the female is the one that produces the berries. The male plant produces white flowers that pollinate the female plant by insects and bees. There has to be at least one male plant for three or four females in a two-mile radius. Berries will not form if both genders are not present. Plant all holly varieties in full sun. They also enjoy an acidic soil, so plant with other flowers that like a similar soil pH, like azaleas and rhododendron. 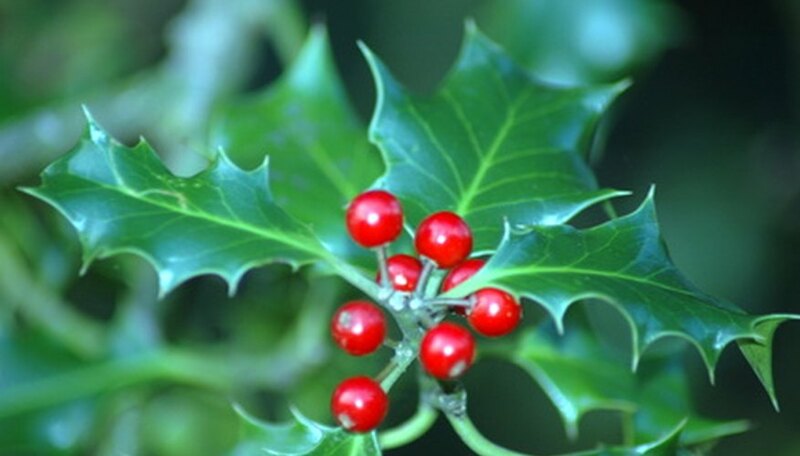 Avoid planting holly near a playground or anywhere children would play. The berries are tempting and look like candy. Eating two or three berries can cause nausea, vomiting and diarrhea. 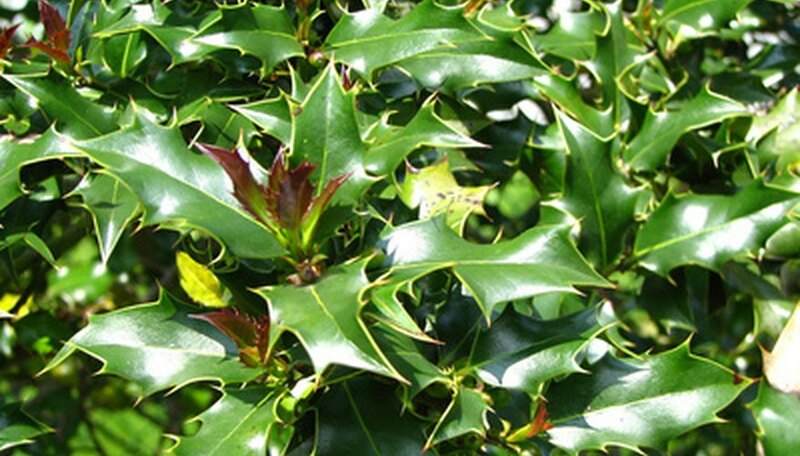 The leaves are thorny and can cause injury if a child were to fall into a holly bush. Japanese holly is a great dwarf variety to plant. Standard Burford holly is best for a hedge and can be pruned to any height to 6 feet. American holly grows 50 to 60 feet high. There are holly varieties that do not produce thorns. Watch where you plant a large holly tree, because their roots can break through underground pipes and do quite a bit of damage. Blue holly is attractive, but it will not stand up to a hot, dry climate. Plant green varieties in warm climates. Will Holly Grow Foliage Back After Deer Eat It?